Professional cake decorating company Renshaw has launched a brand new range of simple cake decorating ingredients into Booths stores, and they are celebrating the launch, and the Royal Wedding, with a delicious and easy to create recipe for Royal Cupcakes - sure to impress friends and family on the royal wedding day. 11. Preheat the oven to 180C/350F/gas mark 4. Line a cupcake tray with 12 paper cases. 22. In a bowl, cream the butter and sugar until light and fluffy. Add the egg and mix well, then add the vanilla extract. 33. Add the flour, baking powder and milk. Beat until smooth. 44. Divide the mixture between the cases, filling approximately two thirds full. 55. Bake for 20-25 minutes, or until the cupcakes spring back when pressed. Remove from the oven and place on a wire rack to cool. 11. Spread a thin layer of buttercream on each cupcake to form a flat, smooth surface. 22. Gently knead the White Chocolate Icing until pliable. Roll out on a clean, dry surface lightly dusted with icing sugar, until about 3-4mm in thickness. 33. Cut out 12 circles of the same size and place on top of the prepared cupcakes. Using a light pressure, smooth out the Icing. 44. Next, cut out the stencils provided. 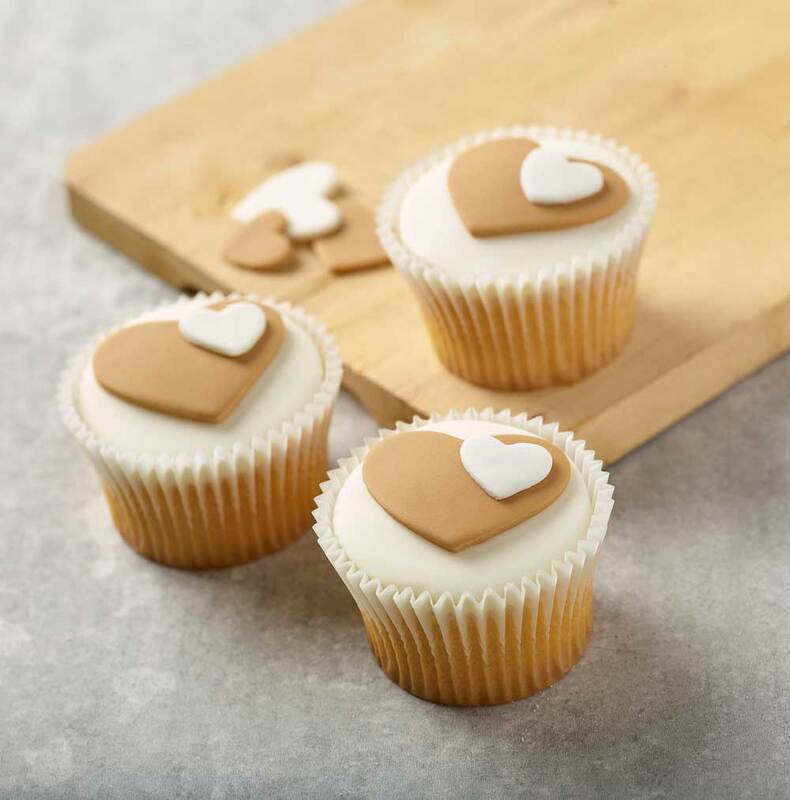 Knead and roll out the Caramel Icing and using a knife, cut around the stencils to create fondant hearts. 55. Use a little cooled boiled water to attach the heart shapes, layering as desired.